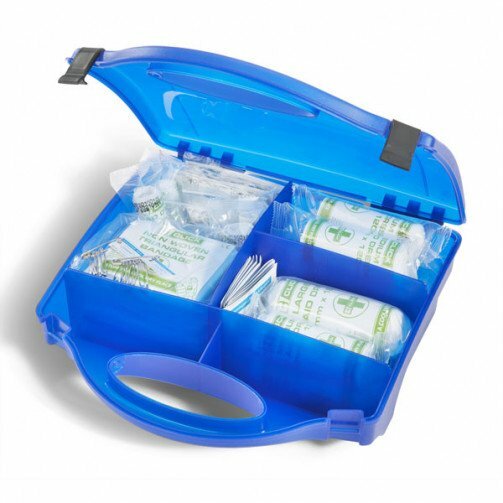 New Elite series of HSE compliant First Aid Kits come in durable polypropylene plastic boxes. For first aid refills, please contact our sales team. • 1 x Guidance note. • 1 x Burn relief dressing (10cm x 10cm). • 40 x Assorted blue detectable plasters. • 2 x Eyepad dressing with sterile bandage. • 1 x Foil blanket. • 1 x Large HSE dressing (18cm x 18cm) sterile Flow-wrapped. • 4 x Medium HSE dressing (12cm x 12cm) sterile Flow-wrapped. • 6 x Blue nitrile gloves (pair). • 1 x Mouth-to-mouth resuscitation device with valve. • 2 x Finger dressing with adhesive fixing 3.5cm. • 1 x Conforming bandage 7.5cm x 4m. • 1 x Microporous tape 2.5cm x 5m. • 20 x Sterile cleansing wipes. • 2 x Single use triangular bandage 90cm x 127cm. • 1 x Universal shears small.